We are not a typical company, your consultant is not your average writer, and our CV book, The One Page CV, is no ordinary CV book either, which is why a top UK publisher was so keen to snap it up. The book is new, radical and should shake up the CV book market.Click to preview the CV book. So what is new/different about it? Well for starters it isn’t really written in the style of a typical CV book. Paul wanted it to be a lot more entertaining and engaging than the norm, and the writing style and some of the illustrations reflect this. It certainly isn’t one of those curriculum vitae books that will send you to sleep! Setting an example without typical examples! Additionally, Paul didn’t want it to be just one of those typical books that is simply padded out with (frequently poor) examples, and just encourage the reader to copy them parrot fashion. The main reason for this is that it simply isn’t effective. The best CVs are all 100% original, and tailored for you personally, based on your own particular circumstances, needs and desires – as well as for your target job of course. Most typical CV books tell the reader what to do in quite a generic, matter of fact kind of way. This all-serves-one instruction manual approach isn’t really effective for you the reader, because it is completely out of sync with what we have just touched upon above, namely that if you want the best CV for you then it needs to be written specifically for you and your own circumstances – not for anyone else or even other people in general. The only way to achieve this is to encourage and enable you the reader/jobseeker to think for yourself; giving you the tools and know-how to really understand and optimise key aspects of CV writing for yourself. This is precisely what Paul’s book sets out to do, and does. Some CV books seem to deliberately try to bamboozle the reader using jargon, convoluted terms and sometimes even suspect statistics. Strikingly, one usually significant thing that is sometimes missing from such books are straightforward lessons that shows the reader plainly and clearly, and step-by-step, just how to construct a top quality CV. Amazingly, some conventional CV books do not even touch upon hugely important aspects such as writing powerfully yet concisely. Some conventional books include various anomalies. For example, some authors extol the virtues of one page CVs yet quite paradoxically list lots of examples that are two pages or above! Similarly, other books talk about the importance of engaging the reader, yet do so in such a manual style and matter of fact manner that quite ironically they risk sending the reader to sleep in the process! Paul wanted to avoid such paradoxes in his book, so when he talks about the need to engage the reader you can see from the style of writing, and the content, that this is coming from someone who knows about, and who is used to, engaging readers. 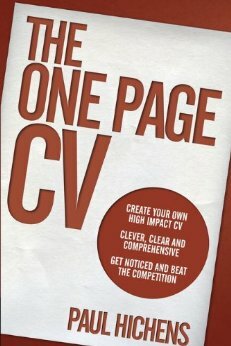 Similarly, when Paul talks about the advantages of one page CVs, he not only goes into this in far more detail than other books, but he actually goes a lot further by including straightforward, easy to follow lessons and examples to show the reader how to refine their CV down to one page. One of the main reasons why it’s different is down to the fact that quite unusually (as well as surprisingly), it was written by a genuine top professional CV writer, rather than laymen. Somewhat amazingly, most CV books are actually written by people who do not write CVs day in, day out for real clients. This is one reason why a lot of CV books are very similar to each other. In fact, one school of thought suggests that a lot of CV books are very similar to each other because the authors need to get their information from somewhere, and if they don’t write CVs themselves, then they need to get this information from another source, and the natural first port of call is another curriculum vitae book. It is somewhat flawed and self-perpetuating – but it does explain a lot! When Paul’s book was in the process of being published by a top career sector publishing company the publishers asked him lots of questions about the art of CV writing, as well as asking for explanations about numerous particular points (and especially points where Paul highlighted flaws in traditional CV writing methods). Paul was actually very surprised at just how little the publishers actually knew about the subject, and especially since they had published other CV books previously. He observed that while publishers were experts in publishing, and across a wide variety of areas/fields, CV writing just wasn’t one of their specialities. This is natural when you think about it. Just because publishers are experts in publishing (and very good at it), it doesn’t necessarily mean that they are experts in that particular field themselves. Right from the onset Paul’s goal was to help the reader create the best possible CV for him/her. If he/she used traditional CV writing methods, or simply copied examples parrot fashion – as encouraged in conventional CV books – then this wasn’t really going to help the reader achieve his/her job and career objectives. All that would achieve is something that is similar to everyone else. The only real way to really help the reader achieve his/her goals is to firstly educate the reader not only about the fundamentals of top quality CV writing, but also go beyond this and to give him/her the tools, knowledge and structure to think for himself/herself so as to engender the creation of a vastly improved, better optimised and ultimately more powerful CV. With this in mind, it is therefore no coincidence that Paul’s book concentrates more on teaching the reader as an individual via carefully planned, step-by-step lessons, rather than preaching to the masses in jargon and padding the book out with (typically flawed) examples. Is this book a replacement for a professional CV writing service? This really depends on you, your budget, and how serious you are about achieving your career goals. Paul’s book is suitable for anyone, in any sector. Regardless of your job or level of seniority “The One Page CV” should help you improve your CV, and like no other book. At the same time, it should be said that whilst you most certainly should be able to make many improvements on your own curriculum vitae, just by reading the book and following the lessons, the CV you produce won’t be the same as a professionally written CV from CV Succeed. At CV Succeed we have the very best curriculum vitae writers in the business, and just like in any sector experience and ability are extremely valuable, and inevitably do make a difference. Just like cutting your own hair, rewiring your own house, fitting your own kitchen or making your own wedding cake – yes you can do it yourself – but you are unlikely to do it as well as seasoned experts/real specialists. In the case of our consultants here at CV Succeed, they are all highly qualified, vastly experienced naturally talented creative writers. There is no real substitute for that, and if you want the best possible CV, to give you the best possible advantage in the job market, then there is no one better.